AVIR leadership is happy to announce that registration for our 2014 Annual Meeting in San Diego is now OPEN. Please take advantage of earlybird registration and save. Our Program Director has put together an outstanding and diverse educational opportunity for you. With three full days of lectures, two days of simulation training, and one day of VI exam review you’ll have plenty of options. Along with this, AVIR is also accrediting SIR sessions so you can attend them when AVIR is not in session. 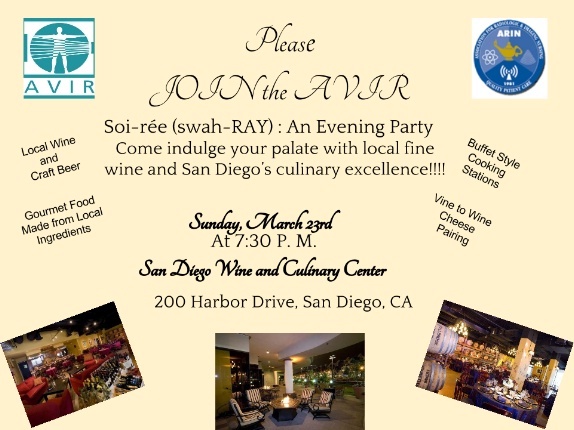 On Sunday night, join us at the San Diego Wine and Culinary Center for our AVIR Soiree. Admission is complimentary for all AVIR registrants and you can purchase a ticket for a guest for a small fee when you register. Come get to know your colleagues in a less formal setting and get a taste of San Diego. EDUCATE – More Than Twenty CE Credits on Topics Relevant to You. SIMULATE – Schedule Yourself in a Simulation Course. COLLABORATE - With our ARIN Colleagues at our combined session on Sunday. PARTICIPATE – Join the AVIR Team – Apply for a position or open a local chapter. APPRECIATE – Say Thank You to our Sponsors by visiting their displays. ACCLIMATE – Set some time aside to check out this amazing city. ASSIMILATE - Network at our Social Function and Lets get to Know Each Other. AVIR-Miami (South Florida) Chapter is inviting all Radiographers, current and future members, to our next meeting. Come and spend some quality time with your colleagues. This is a great opportunity to share experiences as well as be part of a great national organization. Is Your IR Program Stuck? Is your IR program stuck? Try these three growth strategies. Ingrid Lund, Practice Manager Every program wants to grow, but many interventional radiology (IR) programs find themselves stuck in a "steady state conundrum"—all of their resources are being allocated to meeting current demand, leaving little left to put towards growth. In my latest article, you`ll learn three strategies for accessing more of your hospital’s resources, expanding your program, and maintaining a strong foothold in the inpatient market. Once you`ve learned these strategies, register for our upcoming webconference for even more guidance on improving your IR program.